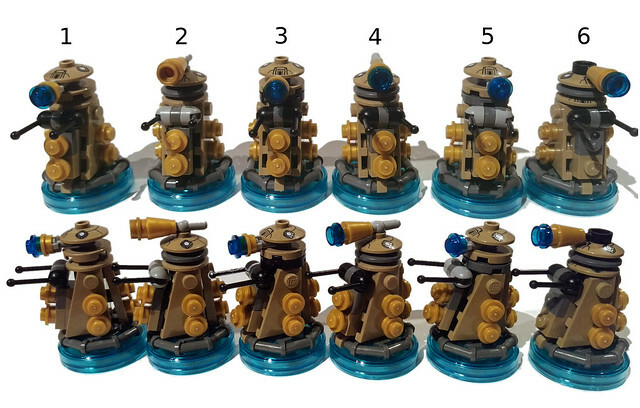 Various variants of Dalek design. Which do you like best? Should the eyestalk come from under the top dish (1, 3, 5) or on top (2, 4, 6)? Coming from under is possibly more realistic, but loses the nice stack of 2x2 dishes. If the eyestalk goes on top, should it use a pneumatic T piece (2 & 4) or a tool wheel wrench (6)? If the stalk goes under, what should go under? Another 2x2 dish (1), a black 2x2 round plate (3) or a dark grey tile with stud in centre (5)? For the gear levers, should I use ones with black or light grey bases (sadly dark tan ones don't exist)? Any other suggestions to improve it are welcome. Based on an original Design by KaptainKobold.